Suddenly, everything is so far along ! The trilliums are coming up. Helleborus foetidus top & Helleborus orientalis above. This entry was posted in Companion Planting, Garden Design, Groundcovers, Shade Gardening and tagged garden design, groundcovers, helleborus foetidus, helleborus orientalis. flowering quince, shade garden. Bookmark the permalink. Oh, how I wish I had the room and sun for a quince! They are gorgeous! spring does not disappoint. and it seems like everything is growing so quickly. looking forward to your garden pics when everything is in full bloom. Seeing progress like this is so inspiring when the weather here in the Midwest is just not going to turn around too soon. Flowering Quince is new to me – it is wonderful. Lovely! Everything should be well watered after the last couple of days. Looking forward to sunshine and low 70’s this weekend…perfect weather for a glass of sherry in the garden! Looking like spring there. What a huge patch of Helleborus foetidus ours looks pretty bad. 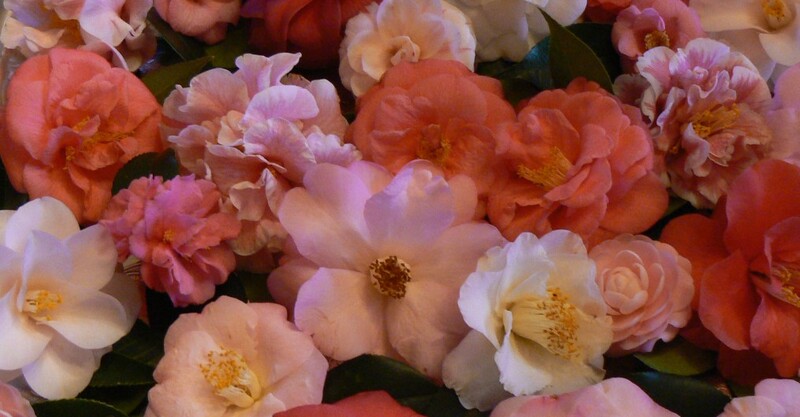 Your gardens are nice I’ve love to walk in ans enjoy those camellias.